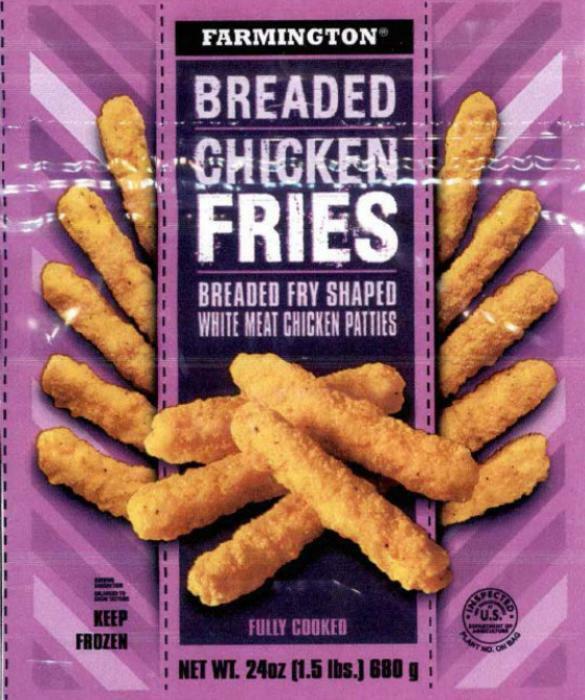 OK Food of Oklahoma City, Okla., is recalling approximately 933,272 pounds of breaded chicken products that may be contaminated with extraneous materials -- specifically metal. 10-lb. packages containing “Smart Foods4Schools ABC – 123 SHAPED NUGGETS WITH RIB MEAT” bearing case code 133002. 10-lb. packages containing “Smart Foods4Schools BREADED FULLY COOKED CHICKEN PATTIES STAR SHAPED NUGGETS WITH RIB MEAT” bearing case code 133003. 10-lb. packages containing “Smart Foods4Schools BREADED FULLY COOKED CHICKEN PATTIES HEART SHAPED NUGGETS WITH RIB MEAT” bearing case code 133008. 10-lb. packages containing “Smart Foods4Schools BREADED FULLY COOKED CHICKEN PATTIES SHAMROCK SHAPED CHICKEN FINGERS WITH RIB MEAT” bearing case code 133013. 10-lb. packages containing “Smart Foods4Schools BREADED FULLY COOKED CHICKEN PATTIES SHARK SHAPED CHICKEN FINGERS WITH RIB MEAT” bearing case code 133014. 30-lb. packages containing “CHICKENTOPIA FULLY COOKED BREADED TENDER SHAPED CHICKEN BREAST PATTIES With Rib Meat” bearing case code 133015. 30-lb. packages containing “Double D Foods FULLY COOKED HERB SEASONED BREADED CHICKEN BREAST PATTY WITH RIB MEAT” bearing case code 178981. 7.5-lb. case containing 5/24 oz. packages of “Great Value FULLY COOKED CHICKEN FILLETS BREADED CHICKEN BREAST WITH RIB MEAT” bearing case code 201258 and “Best By/Use by” date 3/2/2018. 21-lb. packages containing “TenderBird FULLY COOKED, BREADED CHICKEN BREAST PATTIES WITH RIB MEAT” bearing case code 235384. 21-lb. case containing 12/28 oz. packages of “FARMINGTON FULLY COOKED, BREADED CHICKEN BREAST NUGGETS” bearing case code 252385 and "Best By/Use by" date 2/6/2018. 18-lb case containing 12/24 oz. packages of “FARMINGTON FULLY COOKED BREADED CHICKEN FRIES” bearing case code 252386 and "Best By/Use" date 2/20/18. 24-lb. packages containing “Lake Liner Logo Brand FULLY COOKED BREADED CHICKEN NUGGETS” bearing case code 256385. 20-lb. packages containing “SPRING RIVER FARMS FULLY COOKED BREADED CHICKEN PATTIES WITH RIB MEAT” bearing case code 342002. 20-lb. packages containing “SPRING RIVER FARMS FULLY COOKED BREADED TENDER SHAPED CHICKEN BREAST PATTIES WITH RIB MEAT” bearing case code 342015. 20-lb. packages containing “SPRING RIVER FARMS FULLY COOKED Chicken Patties Breaded Chicken Breast Patties with Rib Meat” bearing case code 342384. 20-lb. packages containing “SPRING RIVER FARMS FULLY COOKED CHICKEN NUGGETS Breaded Chicken Nuggets with Rib Meat” bearing case code 342385. 20-lb. packages containing “SPRING RIVER FARMS FULLY COOKED Chicken Fries Breaded Chicken Fries with Rib Meat” bearing case code 342386. 20-lb. packages containing “SPRING RIVER FARMS FULLY COOKED Spicy Breaded Chicken Breast Filet with Rib Meat” bearing case code 342608. 20-lb. packages containing “SPRING RIVER FARMS FULLY COOKED Crispy Chicken Breast Fillet Fritters With Rib Meat” bearing case code 342614. 20-lb. packages containing “SPRING RIVER FARMS FULLY COOKED HERB SEASONED BREADED CHICKEN BREAST PATTY WITH RIB MEAT” bearing case code 342981. The recalled products, bearing establishment number “P-7092” inside the USDA mark of inspection, were shipped to retail locations and institutions nationwide. Customers who purchased the recalled products not consume them, but throw them away or return them to the place of purchase. Consumers with questions about the recall may contact Abby Brown at (479) 312-2409.